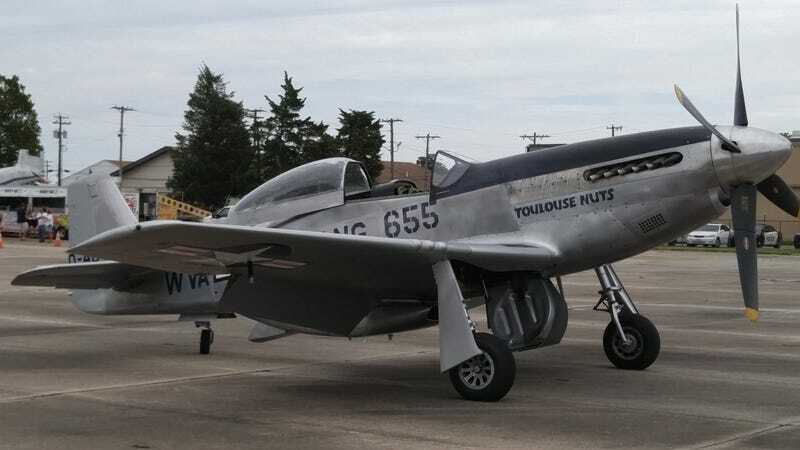 I ticked another item off of my ‘Bucket List’ on Labor Day with an hour-long instructional flight in ‘Toulouse Nuts’, a Dual-Control P-51 Variant recently restored and operated by the Collings Foundation. This stunning aircraft was the Grand Champion at OSH2016, and flies with the Collings Foundation Wings of Freedom Tour all summer. If you make a generous tax-deductible donation to the Collings Foundation, you can receive ‘Flight Instruction’ in this rare and beautiful aircraft. Kudos to the Crew, and Pilot (Tom) for an outstanding showing today. Pre-Flight: Tom helps me climb into the backseat of the Mustang-built-for-two. I get settled and realize I just strapped on a parachute. I pause for a second and then strap into the 5-point harness - I am one with the Mustang. We discuss comms and bail-out procedures and my past flying experiences. We’re both geeked to fly, so Tom jumps in and completes his pre-flight checks. Start-up: Prime the oil pressure, engage the starter, and let ‘er rip ! The Rolls-Royce Merlin engine angrily stumbles to life and settles in to a lope-y idle, spewing 100LL AVGAS fumes in it’s wake. Apparently, they used to run 140 Octane (Purple) fuel in these high compression higher-altitude capable fighters, but 140 Octane Fuel is very difficult (and expensive) to find these days, so the Merlins have been detuned a bit to drink the ubiquitous 100LL AVGAS (blue). It smells wonderful in this scene. Take-Off Roll: Rotate the throttle to WFO and hang on ! The 1400HP Supercharged Merlin spins that 11'2" prop around in a hurry, and the Mustang accelerates swiftly. Since it’s a tail-dragger, the rear wheel lifts off of the ground first until you reach take-off speed and rotate. We flew level across the field and then banked up and to the left sharply. This aircraft pulls some G’s ! In-Flight: The TF-51D performs superbly. The massive Merlin generates enough torque on the prop that even minor changes in power require re-trimming the ailerons, rudder, and elevator. The Mustang wants to climb at every chance, and sloppy turn negotiation results in significant climb rates. The stick is moderately heavy, but responsive. While loafing along at 250MPH(!) in the Mustang, basic flight maneuvers are effortless. The rudder pedals are heavy, but do not require significant input to get the job done. During my one-hour flight instruction, I got a ton of stick time, and Tom demonstrated some of the exciting capabilities of the TF-51D. We executed several barrel rolls, a half cuban, complete loops (4G’s ! ), and four-point rolls. To say this kind of flight in such an historic aircraft was incredible hardly begins to describe the experience. Debrief: It really is hard to comprehend how amazing this experience is until you’ve done it. I have flown in many different light aircraft in the past, but none of them compare to this - not by a long shot. The sheer torque generated by the Merlin and the thrust from that 11' prop out front is impressive. Chills. It’ll give you chills. Add this experience to your bucket list and then go meet up with the Collings Foundation folks for a flight of a lifetime !